Community meetings are often held to engage community members, hear more voices and get more viewpoints. The question is, how to facilitate a community meeting so that these goals are achieved? Before we answer that question, let’s step back and take a look at the definition of community that we’ll use here in this blog. While we usually think of “community” as a group of people tied to a specific geographic location, the word “community” can also describe people who unite around a common interest or characteristic. Thus, a community can form around social, religious or occupational interests. This latter type of community is what we’ll talk about here. When the purpose of a community meeting is to get feedback and input on something that has already been produced (e.g., a prototype, a policy, a marketing plan, a community revitalization scheme, an organizational strategy), communities have the unfortunate tendency to want to tell you what’s wrong with it. Have you experienced the following scenario at a meeting? There’s a typo in the third paragraph. I really don’t like line ten. I think statement five should be put before statement four. And so on until the meeting agenda completely goes off the rails. As with all innovation efforts, when we hold a community meeting, we want to advance the thinking. If the community tells us only what’s wrong with our prototype, not only is the feedback of little value, but we come away without understanding where we’ve hit the mark. What was right about what we presented? We didn’t engage participants in a balanced conversation about what is being done and what could be done. And, without rounding out our proposed solution with the community’s best thinking, we may leave out parts of the solution. After spending countless hours preparing for and then holding a community meeting, coming away with an incomplete solution is not something you want to do. Nor do you want community members leaving your meeting with a sour taste in their mouths and memories of the meeting being little more than a poorly run complaint session. How to Facilitate a Community Meeting? People give you their best thinking when they know what you need from them. Make it clear to the community members their role in the process. Make sure they understand the context of what you’re doing. Let them know the intention and outcomes of their engagement. 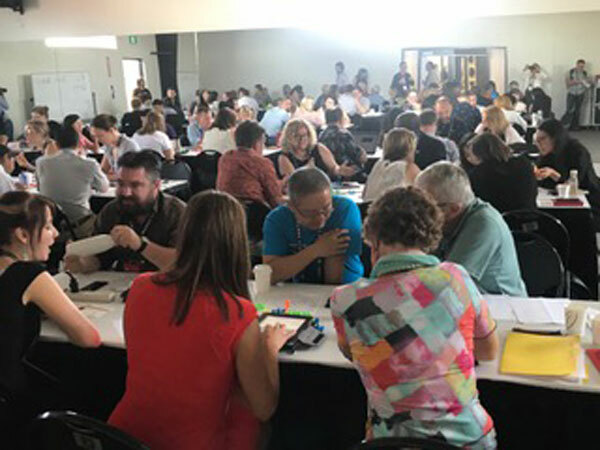 Work with a strong facilitator who brings creative thinking, creative problem solving and digital facilitation tools to structure the meeting’s design and manage the group process. 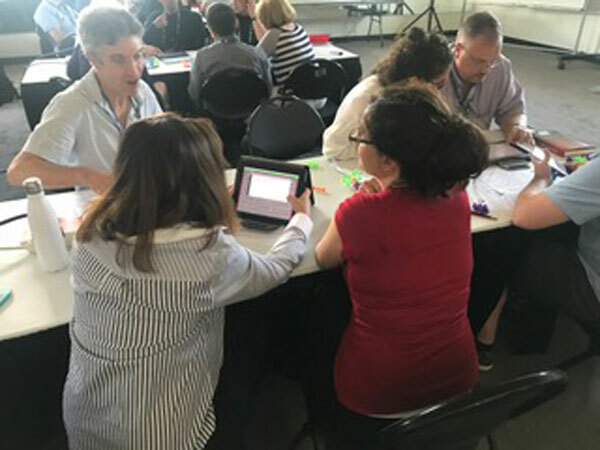 Janice Francisco and Ginny Santos of BridgePoint Effect recently facilitated the Tech for Good community meeting held during True North, an annual conference in Canada’s technology hub, Waterloo, Ontario. 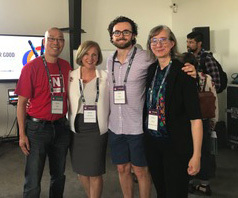 The focus of this year’s conference was the intersection of humans and technology, and appropriately, the Tech for Good meeting was an opportunity for stakeholders in Canada’s technology community to engage in conversation about how technology companies are advancing technology. Tech for Good is a response to a global concern about how the rapid changes in technology are affecting society and how personal data is being used and abused. It’s a joint initiative of Communitech and the Rideau Hall Foundation. The purpose of the Tech for Good community meeting was to get feedback on the first iteration of the Tech for Good Declaration. The declaration was based on national and global data from research conducted by Deloitte and IPSOS, and by hosting open discussions through workshops and open-forums. 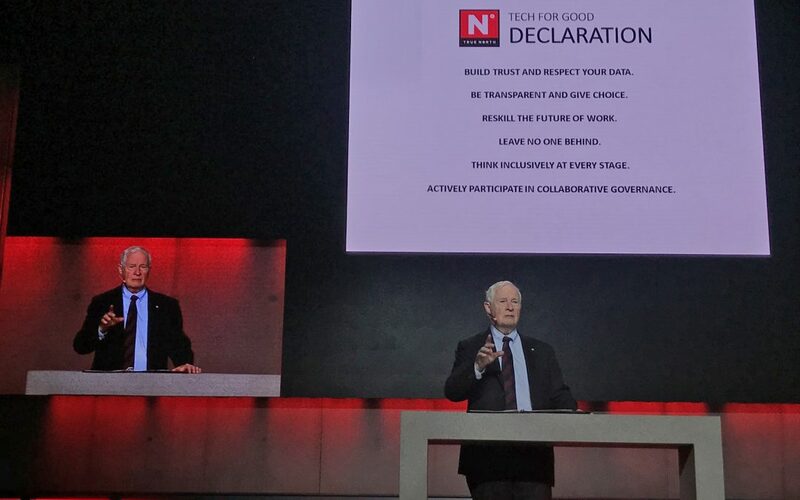 The 28th Governor General and innovation champion David Johnston would read the new version of the Declaration—the planned outcome of the Tech for Good meeting—at 9:15 am on the last day of the True North conference. No pressure! The meeting organizers needed to engage community members to give feedback on the first iteration of the Declaration. Achieving this objective would be hard without a facilitator who would ensure strong and structured participation and without an efficient way of collecting and reporting on the feedback. Communitech chose BridgePoint Effect to facilitate the Tech for Good meeting because they were aware of the work we do in creative problem-solving in the innovation space. They had seen us previously deliver a session using the powerful Stormz digital facilitation tool for a community of executives. The meeting organizers knew that we would bring specific tools to ensure they got the creative thinking needed to advance the Tech for Good cause. And they knew we would not allow participants to go down the “what’s wrong with it” rabbit hole. Before the meeting, we reviewed the proposed agenda, along with their intention and desired outcomes. Because of our depth of experience and knowledge of creative problem solving and digital facilitation, we were able to suggest a more efficient way to achieve their objectives, along with fostering productive and valuable feedback. We jointly facilitated two, ninety-minute sessions, each with sixty people. The meeting organizers did a great job of getting a diversity of voices in the room, not only the experts but other stakeholders as well. We had rules for community members: defer judgment and seek wild ideas. By having us as facilitators, the meeting organizers were able to be there with the community, engage with community members and enjoy the “buzz” in the room. They didn’t need to worry about taking notes, managing the agenda, getting people back on track, or pulling people out of the “what’s wrong” rabbit hole. Nor did they need to worry about preparing an after-meeting report. We arranged the meeting so that three participants would share an iPad to use Stormz, a typical set-up. A secure cloud application, Stormz replaces the usual sticky notes and flipchart paper. Using Stormz, participants felt their contributions were being taken seriously as they could see their ideas posted on the main screens immediately. Seeing other people’s ideas—all posted anonymously so that no one need feel shy or nervous about making a point—triggered new ideas and allowed people to build on the ideas of others. None of this would work however, unless we brought creative problem solving to the equation and effective collaborative group process to the table. We made sure that people understood what constituted good feedback—feedback we could do something with; feedback that advanced the thinking about what needs to be included in the Declaration so it had real value to Canadians. The ideas entered on Stormz were the product of a carefully structured agenda, asking the right questions, and providing the right exercises to prompt people’s best thinking. And we gave people the opportunity to work collaboratively in small groups, thereby removing the shyness factor about speaking out and creating an opportunity to hear a diversity of viewpoints on the issue. The two sessions were held on the first day of the conference. 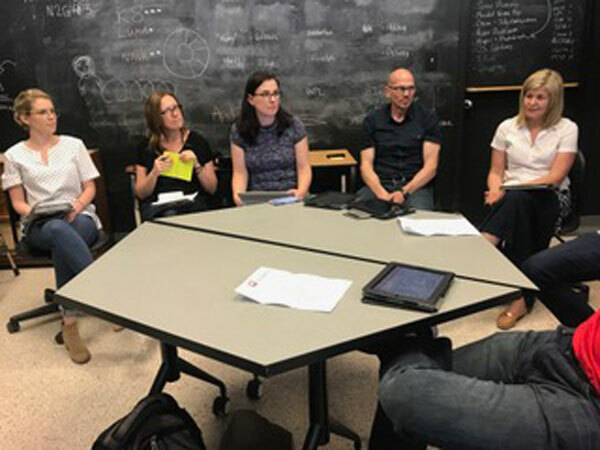 That evening, with stakeholders from Deloitte, IPSOS, and the leads from Communitech and Rideau Hall, we led the review of the feedback collected from participants. Stormz provides comprehensive reporting at the push of a button. We sat with the organizers for two and a half hours, during which time we identified specific areas where the Declaration needed revising. We finalized the Tech for Good Declaration that would be read out by David Johnston the next morning. Mission accomplished! You can read the final Declaration here. Tech for Good community members reflected on their experience in the facilitated sessions. They were amazed at how much we accomplished in such a short time—ninety minutes. They thought the sessions were well-run and organized. They were very happy with how they were engaged and enjoyed having conversations with others about their views. The crew from Communitech were pretty impressed with how seamlessly and effectively the technology integrated with the people in the sessions. People knew how serious we were in taking their feedback because they saw their thoughts, in their own words, captured and displayed on the main screen. They knew that what they said mattered. 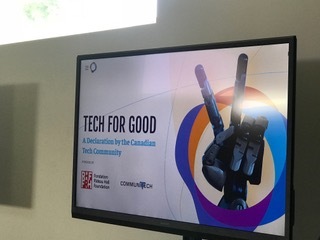 BridgePoint Effect is proud to have contributed to the final Tech for Good Declaration. We are thrilled to be involved in innovating and solving real problems regarding data collection and the use of technology in our ever-changing world. Are you planning an all-staff event, a town hall or a community event where you need the community’s collective voice to advance your cause? We offer a complimentary consultation where together we’ll talk about the difference strong facilitation, creative problem solving and digital facilitation can make to the quality of feedback from your event. Contact us using the form below.